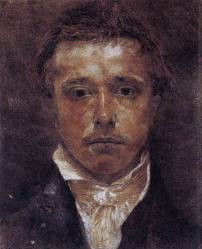 Just finished a biography of C19th painter and dreamer Sam Palmer ( Bloomsbury 2011) by Rachel Campbell-Johnston, art critic of the Times. Apart from the stunningly beautiful 1826 self portrait (c Ashmolean Museum Oxford) above. I wasn't very aware of his work. Some of this may be due to the fact that his son destroyed many of his paintings after his death, but also that he wasn't very successful in his own lifetime, and he didn't receive much attention until he was "discovered" by British artists John Piper, Graham Sutherland and Paul Nash in the 1940's. Although it's a well written piece, I found the first half most engaging, as Palmer and his band of "ancients" sat at the feet of William Blake, and formed a hippy / religious commune in Shoreham. the second half of his life was more difficult, as he came terms with his lack of success, not the best read when your pushing 63. I don't know how much Dylan took from William Blake, and I'm sure experts will find some Blakeian references in the Dylan cannon. How would Blake be received in our enlightened times?, I suspect if he shared his conversations with the Archangel Gabriel with our society we'd have him on Largactil before you could say care in the community.